This 8-hour course is designed for students who have successfully completed the Basic RiderCourse, Intermediate Rider Course or have riding experience and want to improve their skills. This is basically the "one-day" version of our Skills Camp ($300). This course is typically scheduled on two Sunday afternoons. So, what can you do in 8 hours? The correct answer is "A LOT." This course is eight intense hours of drills and training designed to build your confidence at low speed, develop rapid maneuver skills through cone courses and prepare you for a variety of emergency situations including emergency stopping at higher speeds and hazard avoidance. Be prepared to become a much better rider no matter how good your are already. This is a course you won't want to experience just once. It's a perfect spring time tune-up or brush up later in the riding season. Many of our return students sign up every year. 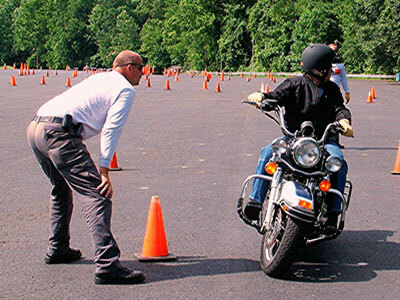 You will be riding under the direct supervision of a professional motorcycle instructor with years of riding and teaching experience. There will be one instructor for every two to three students. You will get a lot of personal attention so you can work at your own pace. This is a physically and mentally demanding course so we encourage you come fresh and ready to ride. We encourage you to bring a bag lunch because we gather at lunchtime to discuss riding techniques and motorcycle dynamics. This is a tremendous opportunity to "pick the brain" of a professional to answer all of your questions. We offer this course several times each year (check the schedule). You can ride your motorcycle or ours. We prefer that you ride ours so you won't be afraid of damaging your dream machine. You can ride our Harley-Davidson Police Road King or Dyna (cost is extra) or a Suzuki TU 250. We'll help you choose the right ride for you.